Foothills Community Church began on 18 October 1947 as the Mennonite Brethren Church of Pincher Creek; it began as a church plant of the Coaldale Mennonite Brethren congregation and organized as a separate congregation in 1948 with 20 charter members. In 1972 it became Foothills Gospel Chapel, and in 1983 Foothills Community Church. 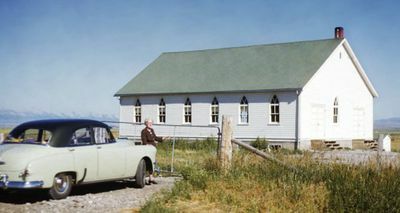 On 23 October 1949 the church dedicated its first building, located four miles east of Pincher Creek on the Halifax Road. After moving the building into town at 520 Charlotte Street and doing some renovating, the building was rededicated on 10 November 1968. In 1999 the local Alliance Church joined with Foothills, the Alliance property was purchased, and a new building erected. It was completed in 2004, with first services held in October 2004. The congregation closed on 31 January 2014. The building and church assets were given to the Alberta Mennonite Brethren Conference for a possible church plant in the future. Friesen, Melissa. "Foothills Community Church (Pincher Creek, Alberta)." Personal e-mail (30 January 2012). Mennonite Brethren Herald (March 2014): 21. Epp, Marlene and Sam Steiner. "Foothills Community Church (Pincher Creek, Alberta, Canada)." Global Anabaptist Mennonite Encyclopedia Online. June 2014. Web. 21 Apr 2019. http://gameo.org/index.php?title=Foothills_Community_Church_(Pincher_Creek,_Alberta,_Canada)&oldid=163617. Epp, Marlene and Sam Steiner. (June 2014). Foothills Community Church (Pincher Creek, Alberta, Canada). Global Anabaptist Mennonite Encyclopedia Online. Retrieved 21 April 2019, from http://gameo.org/index.php?title=Foothills_Community_Church_(Pincher_Creek,_Alberta,_Canada)&oldid=163617. This page was last modified on 11 March 2019, at 02:09.